The Sharjah International Book Fair just missed last year’s record-breaking 2.38 million visitors, but it was still a fabulous show, with 2.23 million turning out to the UAE’s biggest literary event. Sales numbers haven’t been announced yet, but at day 7 (of 11) were reported to be running at 15% higher than 2017’s record-breaking sales. As and when those numbers become available I’ll update this post. Social media is of course the driver of the Global New Renaissance we are witnessing, and nowhere was that clearer than at Sharjah this year, with 2.7 billion social media impressions. But in the shadow of Sharjah, running almost identical dates, was the Algiers International Book Fair along the Mediterranean coast in Algeria. And while the publishing world’s attention was understandably on Sharjah, and almost universally ignored the Algiers event, a further 2.2 million visitors were quietly filing into the third largest book fair in the Arab world. The third largest? In fact Sharjah only comes in in second place. In January the Cairo International Book Fair in Egypt will be trying to replicate it’s 2017 attendance of over 4 million. 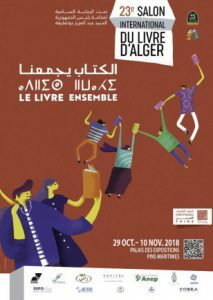 But let’s spare a further thought for Algiers, where on November 1 no fewer than 630,000 people were attending an Arab book fair in a single day. Throw in the Sharjah numbers for that day and we’re likely looking at a million visitors to an Arab literary event in one single day. And lest we think that Sharjah’s slight drop in visitors this year compared to 2017 marks a slipping of interest in books in the Arab world, let’s remember that just days before the Sharjah event kicked off the world’s biggest book sale, Big Bad Wolf, had just wound up, having laid out 3 million books in an eleven day 24/7 flash sale just up the road in Dubai. So much for the notion Arabs don’t read.